Dr. Alexander Waibel is a Professor of Computer Science at the Karlsruhe Institute of Technology (KIT) Germany and at Carnegie Mellon University, Pittsburgh. 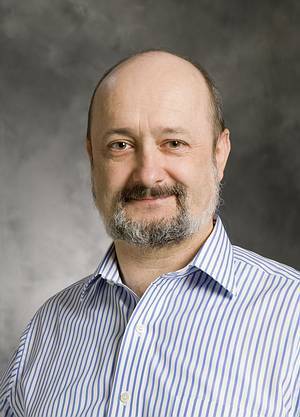 He directs InterACT, the International Center for Advanced Communication Technologies at both Universities with research emphasis in speech recognition, language processing, speech translation, multimodal and perceptual user interfaces. At Carnegie Mellon, he also serves as Associate Director of the Language Technologies Institute and holds joint appointments in the Human Computer Interaction Institute and the Computer Science Department. Waibel’s research centers around Machine Learning algorithms that improve human-machine and human-human interaction. His early pioneering work on the Time-Delay Neural Network was the first “convolutional” neural network. It delivers great performance gains in speech applications, and larger and deeper variants have now led to breakthroughs in speech recognition, handwriting recognition, image processing applications and many other fields. Neural and statistical learning is also the basis of many application system developments. His team has developed the JANUS speech translation system, the first American and European Speech Translation system, Jibbigo the first commercial speech translator in iPhones, and more recently the first real-time simultaneous speech translation system for lectures. His lab has also developed a number of multimodal systems including perceptual Meeting Rooms, Meeting recognizers, Meeting Browser and multimodal dialog systems for humanoid robots that merge visual perception, speech, language processing, emotion tracking, to build better assistants. Prof. Waibel was one of the founders of C-STAR, the international consortium for speech translation research and served as its chairman from 1998-2000. He directed the CHIL program (FP-6 Integrated Project on multimodality) in Europe and the NSF-ITR project STR-DUST (the first domain independent speech translation project) in the US. He co-directed IMMI (a German-French joint venture) and Quaero a French-German national project. He was project director of the European Integrated Programm EU-BRIDGE (2012-2015). In the areas of speech, speech translation, and multimodal interfaces, Dr. Waibel holds several patents and has founded/co-founded more than 10 successful commercial ventures. Following the acquisition of Jibbigo by Facebook, Waibel served as founding director of the language technologies’ group of Facebook (2013-2014). He and his team also deployed multilingual language technology in several humanitarian exercises and missions. Dr. Waibel received the B.S. in Electrical Engineering from the Massachusetts Institute of Technology in 1979, and his M.S. and Ph.D. degrees in Computer Science from Carnegie Mellon University in 1980 and 1986. His work on the Time Delay Neural Networks was awarded the IEEE best paper award in 1990. His contributions to multilingual and speech translation systems was awarded the "Alcatel SEL Research Prize for Technical Communication" in 1994, the "Allen Newell Award for Research Excellence" from CMU in 2002, and the Speech Communication Best Paper Award in 2002. At LREC 2014 he was awarded the international "Zampolli Prize" and at TAUS 2014 he received the TAUS Excellence Award for work on Speech Translation. Waibel is a Fellow of the IEEE. He was named “Ehrensenator" of the Hochschulrektorenkonferenz of Germany in 2017. In 2017 he was also elected to the National Academy of Sciences of Germany (“Leopoldina”).